Rice Lake, WI – As many motorcycle enthusiasts enjoy target shooting as well as exercising their right to carry, Big Bike Parts® has teamed with TRU-SPEC® to bring market proven tactical apparel to the Powersports Industry. TRU-SPEC® has over 60 years of manufacturing expertise delivering market leading law enforcement and public safety clothing to the market. TRU-SPEC® products are used and proven daily by law enforcement and our military and will be available through Big Bike Parts®. 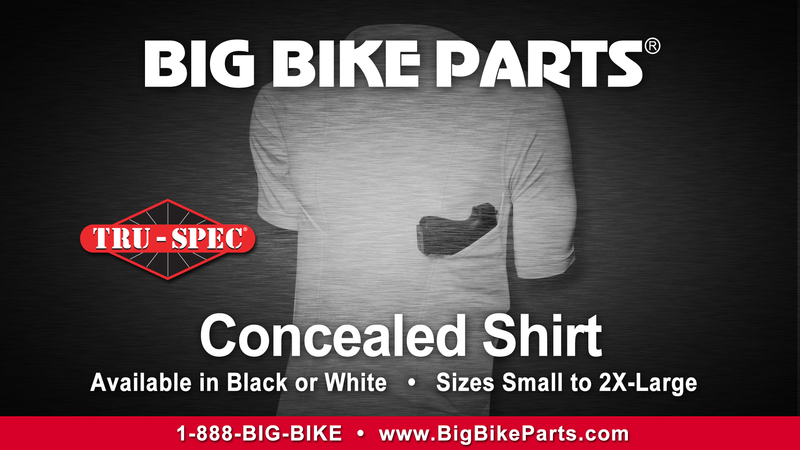 Available now are their form fitted 24-7 Series® Concealed Holster Shirt designed for the best in concealment with a comfortable custom polyester spandex blend. This tailored design reduces sagging by supporting the weight of the concealed object evenly across the body of the shirt. The dense outer mesh layer obscures the profile of what you are concealing. Securely conceals small, medium and most full size handguns, magazines, electronics, wallets, passports or even medical devices in the left and right hand pockets. Heavy polyester reinforces the pocket bottom reducing wear and aids in getting small items out. The moisture wicking material designed with flat-lock seams reduces friction and chafing. Anti-microbial treated fabric extends daily wear. Available in black or white in small to XXL sizes. The comfortable way to carry most anything concealed. Gunnery Sgt. R. Lee Ermey, USMC (Retired) known around the world as “The Gunny” is the official celebrity spokesperson for TRU-SPEC® line of tactically inspired apparel making them “Gunny Approved”.